Nathaniel J. Ruffin grew up in Cincinnati, Ohio where he graduated from Withrow High School. He immediately joined the U.S. Navy where he served four years, and then entered the U.S. Air Force where he would serve for an additional twenty years, including tours of duty in Viet Nam. He married his wife Marie after courting her long distance while stationed in Greenland. They later married and moved to George Air Force Base. Mr. Ruffin first served as pastor of the First Missionary Baptist Church before establishing his own church, Spirit of Christ Tabernacle, in 1982. As Bishop Ruffin, he counseled many in marriage, personal, spiritual, and family matters against a backdrop of actively participating in the local community. 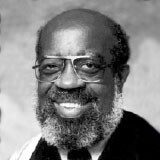 He helped establish the Black Heritage Committee and he was the founder of the Dr. Martin Luther King Program at Victor Valley Community College, where he also was elected to the Board of Trustees in the 1990’s. Outside of his closely knit family, nothing was more important to Bishop Ruffin than taking time to talk to and work with those who needed to hear an empathetic voice or who needed to receive guidance and assistance for personal or professional challenges. He was deeply, emotionally invested in the High Desert Area. The well-being and success of all of its residents was his life’s mission until his death. As part of providing mentoring support to student services, he founded the Black Student Union at Victor Valley High School. He did not limit his mentoring activities to African American students, however, as diverse populations of youth and young adults found in him an accessible and caring counselor. Bishop Ruffin died on November 19, 2009. DVL recognized his invaluable contributions to the High Desert communities in naming him a DVL Honoree. Later, it would select him posthumously to be one of the four original “Legacy” individuals whose lives and civic contributions would inspire adults and young people alike in the community. A Legacy Scholarship was named in his honor because of his positive influence in the lives of young high school students and their families. Dr. Gerard D. Brown, Jr., D.D.S.